Autonomous trucks: How soon and how much? Despite many countries rising up to the challenge of autonomous trucks, it is highly unlikely to yield a truly driver-less automobile. Excitement about automonous trucks continues to rise. Especially after Daimler AG put an autonomous truck on the German autobahn last year and followed it up with an autonomous drive over a public road in the USA. More and more countries are rising up to the challenge of autonomous trucks. In his budget speech on March 16, 2016, Chancellor George Osborn announced that government will establish in UK a global centre for excellence in connected and autonomous vehicles; conduct trials of driverless vehicles on the strategic road network by 2017; will consult on sweeping away regulatory barriers within this Parliament to enable autonomous vehicles on England’s major roads; establish a £15 million ‘connected corridor’ from London to Dover to enable vehicles to communicate wirelessly with infrastructure and potentially other vehicles, and carry out trials of truck platooning on the strategic road network. 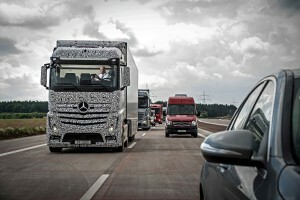 The image of a Daimler engineer reading a magazine behind the wheel of a giant lorry may look amusing and even scary as the truck races down an autobahn, known as a symbol of Germany’s penchant for speed, the question, as more countries join the autonomous vehicles race, and especially that of trucks, is how autonomous will the vehicles actually be? Many may agree to the fact that autonomous vehicle technology has the potential to bring major improvements to journeys, both in terms of convenience as well as safety. The extent of automation, even those that are working on autonomous vehicle programs are of the opinion, or it seems, is not going to yield a truly driverless automobile. Not in the near future, and neither in distant future! 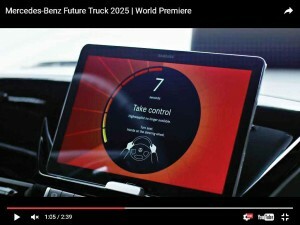 Look at the Daimler’s Highway Pilot autonomous truck trial. The Highway Pilot autonomous control system won approval for trials on public highways in a Freightliner truck in the US state of Nevada. 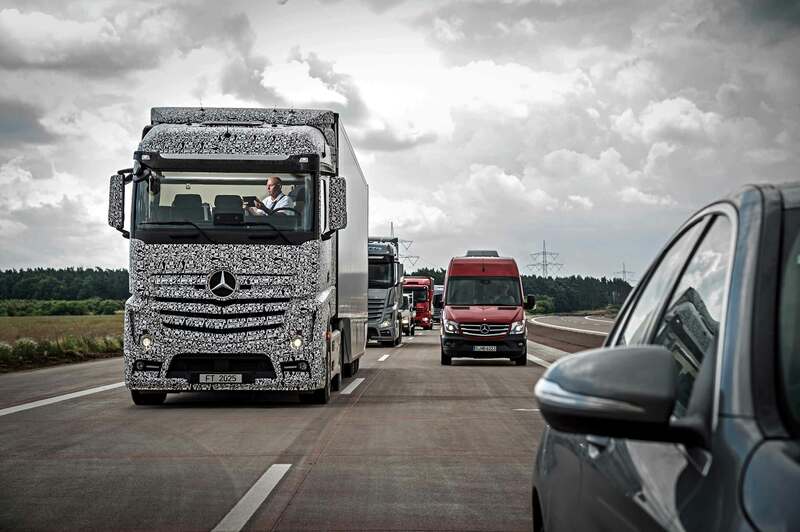 Late last year, the German state of Baden-Wurttemberg approved trials of Mercedes-Benz trucks with the Highway Pilot system on its autobahns. Both, as mentioned earlier, have built a good deal of excitement that giant rigs can actually drive themselves. The reality is, these are one of their kind, and may remain the case. It took a long time to develop such working concepts, and it may take longer than that to create an ecosystem that will accommodate such driverless vehicles. This however should not be a reason to be discouraged; technologies that have gone into these autonomous driving concepts are already found in many modern vehicles. There are some that are closer to production. Almost all of these however work such that they aid the driver, leaving him to make the most important decisions. If Sven Ennerst, Head of Truck Product Engineering at Daimler AG is to be believed, what his company has demonstrated is more or less available even today. Technologies that make a truck to steer itself autonomously. Not quite close, but important, is the mention of Volvo’s dynamic steering technology, which improves maneuverability through a precise electric motor, which is controlled 2000 times per second based on driver input and that of the onboard sensors. 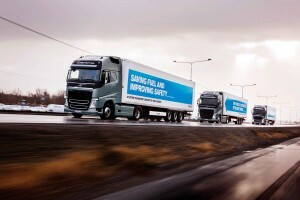 Volvo Trucks have been conducting autonomous and connected truck trials. It did an autonomous truck trail in the USA much like what Daimler managed. The Highway Pilot system steering the vehicle by itself marks a big achievement, and irrespective of the fact that autonomous vehicles will not be the thing of the near or distant future. It builds a picture around the truck, looking up to 250 metres ahead. It is easy to understand what Ennerst is saying when it expressed that the truck can react and drive by itself. 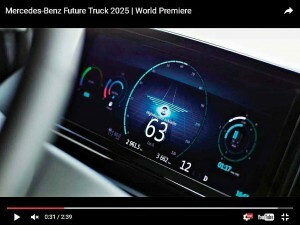 Technologies like adaptive cruise control, automatic emergency braking and lane departure warning that would have been used in the Mercedes-Benz autonomous truck, and comprises of radar sensors and stereo cameras, are already being offered in automobiles. So, the technology is there. What is the bone of contention, so to speak, in terms of who is responsible in a likely event of an accident, are the regulations. They have been framed to suit the local needs and designs. It was perhaps because of this that Daimler found it easy to conduct the autonomous truck trial in the USA rather than in Europe. A United Nations committee recently amended the 1968 Vienna Convention on road traffic to provide the basis for legalisation on autonomous driving. A key condition of this amendment is that the system can be deactivated or overruled by the driver at any time. This is central to the design of the Highway Pilot! Ennerst is known to have said that safety, driver activity and fuel economy will make a business case for automonous trucks. With the demand for fuel efficiency on the rise, the fuel economy part of the business case is easy to understand. In the case of safety, the need is to understand how the introduction of systems like active brake assist and proximity control assist has resulted in the reduction of accident rates. The future of an autonomous truck will depend on how these and a host of other systems are successfully integrated. Set to create an additional level of safety and reduce the number of accidents, automonous trucks are certain to make fleet operators skeptical. It may not account for a profitable business case when they imagine the driver of the truck sitting back and browsing the internet. Ennerst is known to have stated that they expect the driver to take over many of the traffic planner’s functions. The driver would thus become more of a transport manager. With the need for fewer traffic planners, the operating costs of fleet operators will come down. It would also address driver shortage. Driver’s elevation to a traffic manager will make it attractive for him to work as well as earn more. Reduction in fuel consumption achieved by autonomous trucks, which shift gears on their own, and apply the amount of power to have the engine rotate at an optimal rpm, also makes an attractive attribute for lowering the operating costs. Less use of brakes would also result in less wear and tear of braking system components. Most of all, there will be less traffic jams to contend with. 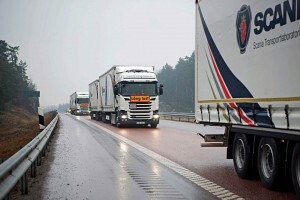 Scania started platooning truck trials in Sweden in 2012. In 2015, it extended the trails to the Netherlands. In 2015, DAF Trucks also began its EcoTwin project in the Netherlands, run jointly with TNO, a Dutch scientific research organisation. This project would involve platooning of two trucks linked by wi-fi so that the driver of the truck behind does not need to brake, accelerate or steer. Braking, acceleration and steering is taken care of automatically, based on signals from the lead truck. According to Ron Borsboom, DAF Trucks Product Development Director, there’s still quite a lot of development process that needs to be done to ensure that the technology is completely reliable in any situation. It is also important that issues like legislation, liability and acceptance also have to be taken care of properly. In UK, Tructyre Fleet Management is among the eight bodies that were awarded government funding totalling £20 million to research and develop autonomous vehicles recently. The project, ‘Pathway to Autonomous Commercial Vehicles’, run by Tructyre also includes the University of Portsmouth, Satellite Applications Catapult and RL Automotive. The aim of the project is to develop an innovative solution to monitor key information from the vehicle and predict safety risks based on analytics. At the core of the research is a tyre pressure monitoring system (TPMS).